ItemBARK_1990.0003.0483 - Chinese girl, possibly Avaline Hoy; circa 1924. Item BARK_1990.0003.0483 - Chinese girl, possibly Avaline Hoy; circa 1924. A young Chinese girl sitting on a wooden chair in front of a dark cloth backdrop. Possibly Evelyn Hoy. 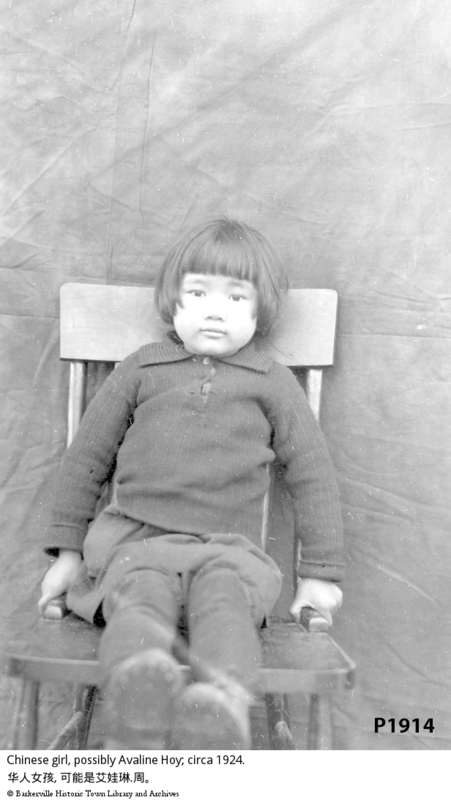 A young girl (chinese) sitting on a pressed back wooden chair, for a portrait. This girl is wearing a sweater, (buttoned up), skirt, thermal leggings, shoes. She is sitting in front of a loosely hung, plain backdrop.